Well,. This version made ​​it clear (and practical) the use of modules. Now in this post I’ll show you how to create a new module, which we’ll call “Hello”. 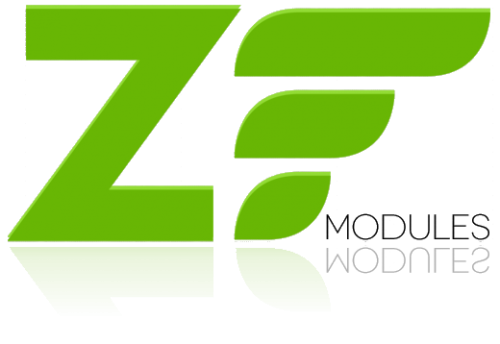 Let’s first create the configuration files of the module, and later we will create two static pages to exemplify the MVC architecture (without the “M” for now), implemented by Zend Framework 2. First Create a new folder called “Hello” within the directory “zf2/module“ . Inside the “Hello“, create 3 folders: “config“, “src” and “view“. Also create a file called ” Module.php “, and leave it blank for now. 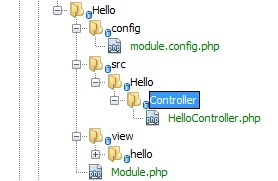 Inside the “src/Hello” Create a Folder called “Controller” (Capitalized same, because the namespace), and also create “HelloController.php” file within the “src/Hello/Controller” folder. Inside the “view” folder, create another folder called “hello” (this lowercase). Finally, create a file called “module.config.php ” in the folder “config“, blank for now. For now these are the directories and files that need. Come to the most important part of this process: The configuration of this module. Okay, our module configuration is set. Now let’s create our first Controller. Line 3: define the namespace. As everything is on the first folder inside the “src /” directory, simply define “Album \ Controller”. Line 5 and 6: Two classes that we will use in the controller, so give a “use” here. Line 10: For every action of our controller, a new function must be defined. When followed by the “Action” at the end. Line 12: define some string in $text variable. Line 14 to 16: we’re pushing for layer display the string created on line 12. Let’s see how it will look in the view layer? Now it’s even easier. We have already defined everything we needed to make the system run, just want to see how to print the view layer that string created there in the controller layer … That’s pacifier in honey. Come on. In turn, the “index.phtml” file references the action ” indexAction ” within the controller ” HelloController “. Did you see how the structure of Zend Framework 2 is well organized? Now copy the code below into the “index.phtml” file. Now go into your browser application with URI ” / hello “or” /hello/index ” (in my end its: http://zf2/hello) and see his first work with Zend Framework 2 running ! That’s it, my friend … The first time we ran this whole process can seem a little complicated, but practice makes perfect, so train. Follow this tutorial two or three times and see that it’s not as complicated as it sounds. Note also that we keep the same layout, so there is no need to configure a new one. But you can define different layouts for modules, including more than one layout per module. It’s all about setup and configuration. Challenge: Try yourself now create a new action, and make it appear on the screen. If you will try also create a new controller ( do not forget to configure the routes and everything else ) and run it. And feel free to also comment on what you thought of this tutorial. Thank you for accompanying me on this journey more. Maybe next post I will show how to work with sql queries to object-oriented with Zend Framework 2 . Warmest regards and until next time. To read and practice this article, I have strongly posered with the zend technology. Really it is very very secrete, which is nicely connected one another, if you understand and well known to use netbeens. I think next and next tutorials, I will enjoy….